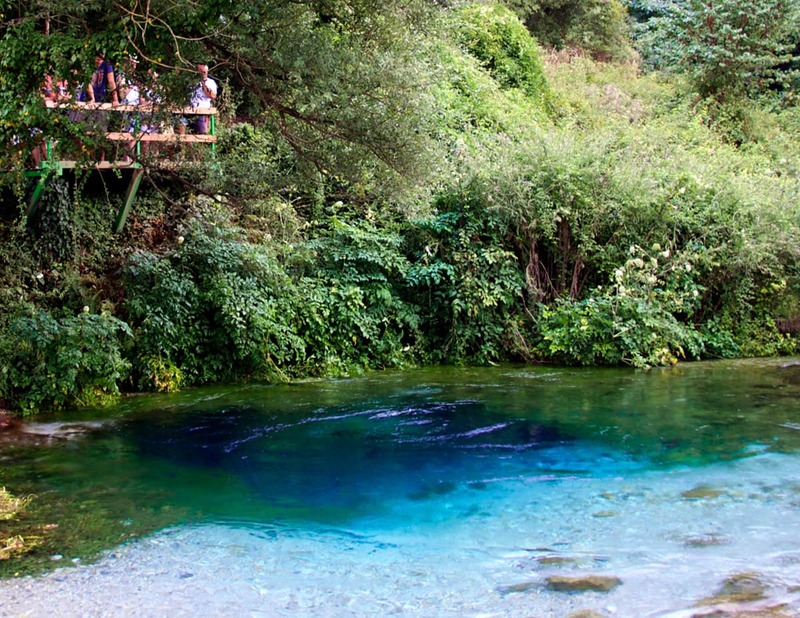 The cold springs in general are not the most popular tourist destinations but Syri i Kalter in Albania is an exception. This enormous spring has such an amazing play of colors that one can look and think – am I really seeing this or dreaming? 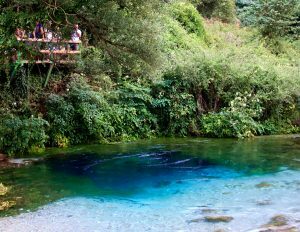 Syri i Kalter is one of the most powerful springs in South-Eastern Europe – a region which has some of the most impressive and diverse springs n the world. This huge spring has formed in Mali Gjere karst massif, on a tectonic fault (fracture of Earth’s crust) between Mesosoic – Paleogene carbonates and Tertiary flysch. Spring flows through a layer of Triassic gypsum and anhydrites. This is so called Vauclusian spring (named after the magnificent French Vaucluse Spring) – ascending spring which comes out from a deep, almost vertical cave. 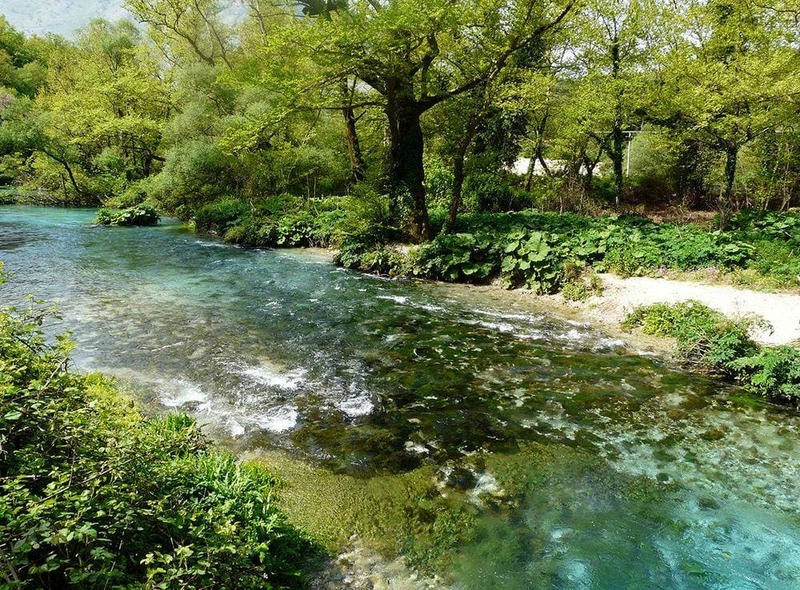 Springs serve as a source of the 25 km long Bistricë river. Depth. Actual depth is not known. Divers have reached the depth of 45 – 50 m (different numbers are named) but have not reached the bottom. Such diving is dangerous – the stream is very powerful and one has to struggle against it in order to get deeper. Discharge. Average discharge of this spring is 6 000 l/s. 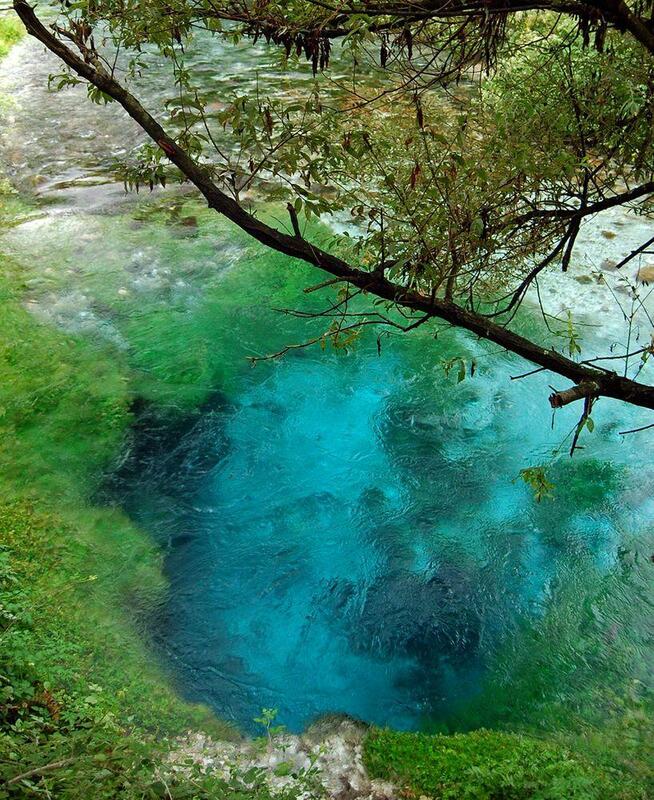 Whole group of local springs (there are numerous smaller springs around) has a discharge of 11 000 l/s. At high water this spring has reached the discharge of 18 400 l/s. Temperature. Water comes from great depth and its temperature is stable. Average temperature is 12,75° C and it fluctuates only per 0.15° C.
Once upon a time here lived a nasty dragon. Or may be not, but at least local legends tell that he lived here. He did the usual things what dragons love to do (at least the dragons of the old Europe) – he terrorised local people, burned the cornfields, took away the water and, of course, kidnapped the girls. According to some versions of legends the dragon was defeated by a clever farmer who burned the dragon by feeding to him a mule with firewood and cinder which was incinerated as the dragon breathed his flame. As the dragon died, his eye turned into a powerful, beautiful spring. The evil was turned into a blessing. The spring looks like an unusual eye indeed. The pupil of the eye is the central part of spring which is very deep and has impressive deep blue color. It is surrounded by "iris" – shallow, light blue colored limestone bed of the lake. The clear, lucid water rises with such speed that there is a bulge over the lake. In fact some visitors throw stones in the spring and then look, how the power of the stream rises the stones upwards. This practice is not advisable – sooner or later stones might disfigure the beauty of the spring. Some Albanians consider that this spring has some supernatural properties. Thus, according to locals, weird things happened in October 2002, when the spring suddenly dried out. It happened during the conversations of Italian and local businesses about the possibilities to obtain the clean groundwater from the vicinities of the spring. There indeed exists a project to harness spring water from the vicinities of Syri i Kalter and transfer it through a pipeline to Italy. Before the mass tourism this had to be a gorgeous place – secluded in mountainous valley, with fairy tale forest of ancient oaks, hazelnut, cherries and multitude of trees around. In the times of communist dictature the site was off limits to general population and only leaders of Communist Party could visit it. Now the times have changed. If one wants to avoid the crowd, he should come here early. In summer months here should be paid entrance fee. At the spring has been built a restaurant – pleasant for visitors but at the same time hopelessly destroying the feel of natures sanctity. Nevertheless this is a gorgeous place, an unusul wonder of nature. R.Eftimi, S.Amataj, J.Zoto. Groundwater circulation in two transboundary carbonate aquifers of Albania; their vulnerability and protection. Groundwater Vulnerability Assessment and Mapping: IAH-Selected Papers. Accessed on November 28, 2015. Zoran Stevanovič, Romeo Eftimi. 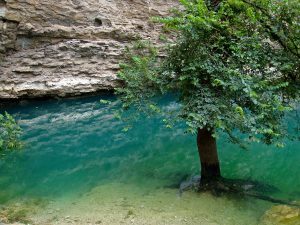 Karstic sources of water supply for large consumers in Southeastern Europe – sustainability, disputes and advantages. Accessed on November 28, 2015. 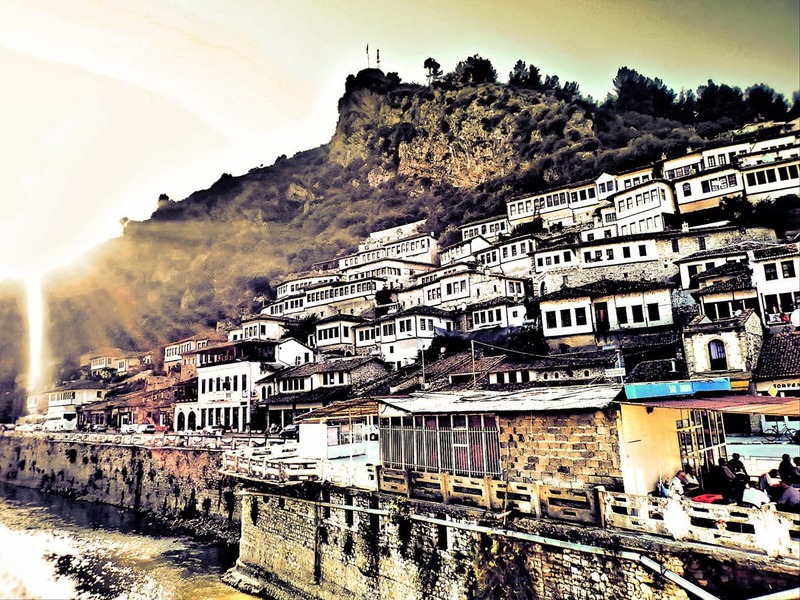 This new, thoroughly updated sixth edition of Bradt’s Albania remains the only standalone guide to this dynamic and rapidly modernising eastern European country, from the capital, Tirana, a lively European city, with shopping malls, cycle paths, museums, galleries and historic buildings, to remote outposts where traditional ways of life prevail. Describes the geography, history, government, economy, people, religion, and daily life of Albania.